Here are descriptions of some of the more interesting or significant changes made to the Eclipse Platform for the 4.0 release of Eclipse. Note that earlier forms of some of these features appeared in past e4 project releases, but all features listed here are new when compared with the previous Eclipse Platform release (3.6 or Helios release). New look for the workbench The default appearance of the platform user interface has been refreshed. The main goals of this update were to adopt a more modern visual style, reduce clutter, and use whitespace rather than extra keylines to separate user interface elements. Tabs and part stacks have been redesigned to reduce emphasis on non-selected tabs and stacks. Global search bar The workbench now has a global search field in the tool bar. This provides a visible affordance for the "Quick Access" feature, and may be used in the future to combine other kinds of searches into a single location. More flexible part layout You can now stack views and editors together by default. For example a view that requires a large working area can be stacked in the editor area to provide more space. Not only can you mix views and editors, but you can split the editor area to put a view beside an editor in the editor area, and then maximize the entire editor area to work with both at the same time. Modeled user interface The Eclipse platform user interface is now represented internally as an EMF model. Applications can reconfigure or extend this model to arrive at very different presentations of their application with no additional coding required. Normalizing the workbench structure as a well defined model has the added benefit of making the code for the workbench itself much simpler and less error prone. Most importantly, this allows for very different workbench UI layouts, such as parts living outside of perspectives, views and editors in dialogs, and other designs not previously allowed by the older generation workbench with its rigid hand-crafted model. Having a model also allows for more advanced tool support for application designers, such as visual design tools. 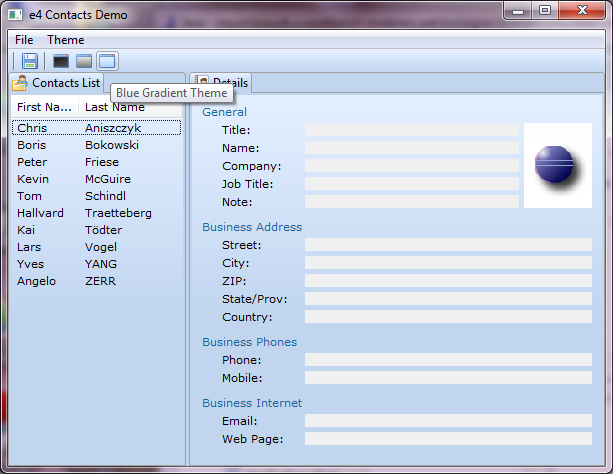 Menus and Toolbars: This is a fairly generic definition, suitable for directly implemented operations. RCP: This is a Sash/Stack/Part containment model very much like the legacy one. Commands: This is the e4 version of the Commands/Handlers/Bindings infrastructure. Use this model if you need more sophisticated operations like key bindings, retargetable commands (Undo, copy...). Trim: Using these elements allows clients to add trim containers on any side of their window and populate them with ui elements. Editing: This is a specific element used to gain access to the legacy editor behavior. Shared Elements: These elements allow reuse of various model elements in different parts of the model. It will be used in the compatibility layer for supporting the sharing of views and editor areas between different perspectives. Pluggable presentation engine The workbench model is now translated into concrete widgets via a generic presentation engine API. The platform includes a default presentation engine that renders the model using traditional SWT widgets, but applications can employ alternate presentation engines to render their application model using a different widget toolkit. Part save lifecycle Workbench model elements can declare themselves as being saveable by using the MDirtyable interface. This allows any model elements to employ the dirty/save lifecycle previously only available to editors and certain kinds of views. Shared UI elements Multiple workbench model elements can share a common underlying widget. A placeholder in the model can be used to indicate that the referenced element should be inserted into the UI rather than rendered, meaning that the same widget structure will be used. This mechanism is used to share views when switching perspectives, but can also be used to share complex UI element structures such as the editor area across different parts of the model. Model fragments Extensibility in the workbench model is achieved through a concept of model fragments. 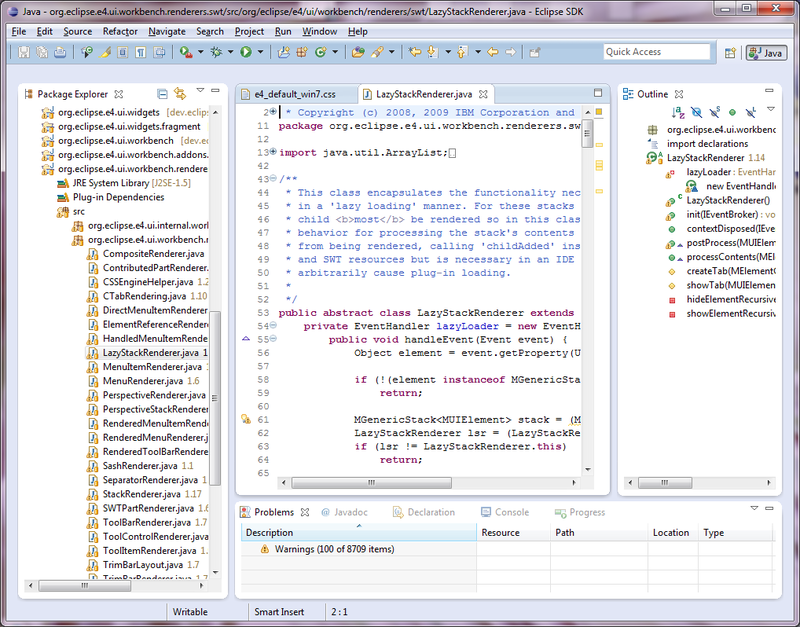 Plug-in authors can provide model fragment that the workbench will merge into the application's "base" model. This is done by plug-ins contributing XMI files using the Model Fragment container from the workbench meta-model. Model fragments can include parts (views and editors in 3.x terminology), commands, handlers, and most other elements from the e4 meta-model. 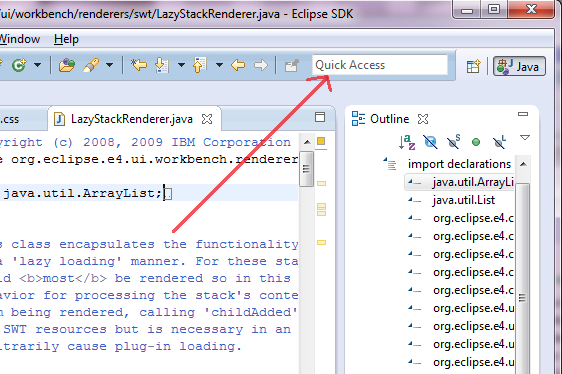 When an Eclipse platform 4.0 application starts up, model fragments submitted by plug-ins are added to the base model, allowing, for example, a view to added to a perspective defined by the application. For example, model fragments from the e4 photo demo can be merged into the model for the Eclipse SDK to create a hybrid of the two applications. 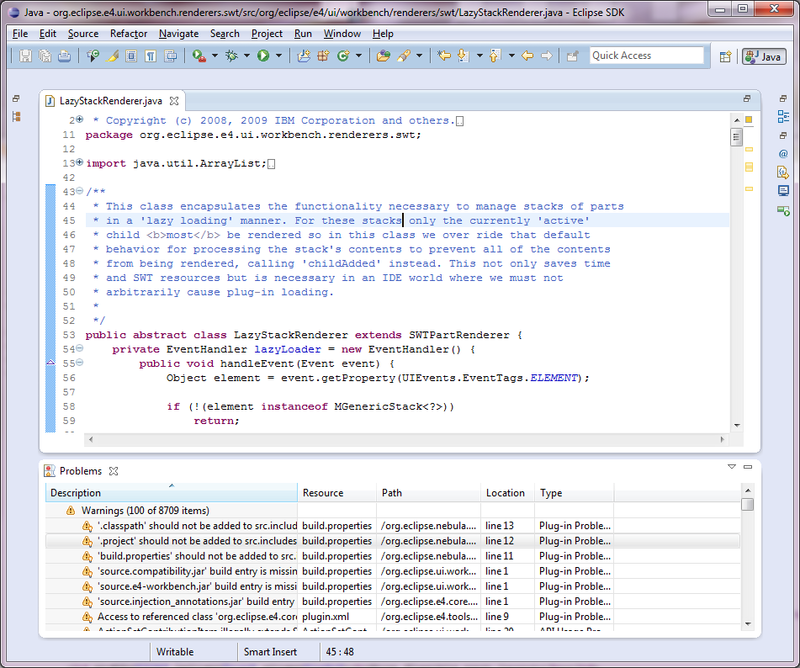 Persistence of application state Changes to an Eclipse application's state, such as where its parts are and which part is active, are now recorded individually and these user modifications are then applied to the source model. This allows changes to the source model to propagate back up to the user if a new part has been added to a stack that the user has modified. UI extension points As we change the user interface to be based on a model, it makes sense to convert UI extension points into model fragments. With such an approach, a view can be described as a model fragment containing a PartDescriptor, rather than an extension to the org.eclipse.ui.views extension point. This reduces the number of different paradigms that developer needs to keep in mind: all information that defines UI extension points comes from the model, and all extensions can be placed and cross-referenced in one model. At the same time, all of the existing org.eclipse.ui extension points continue to work, so that existing plug-ins continue to work as expected in Eclipse platform 4.0. Widget styling with CSS The workbench now defines a pluggable styling engine that allows the appearance of widgets to be customized declaratively using Cascading Style Sheets (CSS). Widget details such as fonts, colors, borders, and icons can now be customized via application-defined CSS files. This mechanism supports changing styles on the fly while the application is running. The Eclipse SDK 4.0 includes styling data to implement the new IDE look and feel, but rich client applications can employ different CSS styling to achieve a significantly different widget appearance. Flexible tab rendering In the platform 3.6 release, SWT introduced API to allow a different renderer for CTabFolder to be plugged in. The workbench now uses this pluggable rendering to implement the new 4.0 workbench look and feel. Context hierarchies. Contexts can be nested within a parent context to override services provided by their parent. This enables application code written in one context to be easily transferred to work in different contexts. 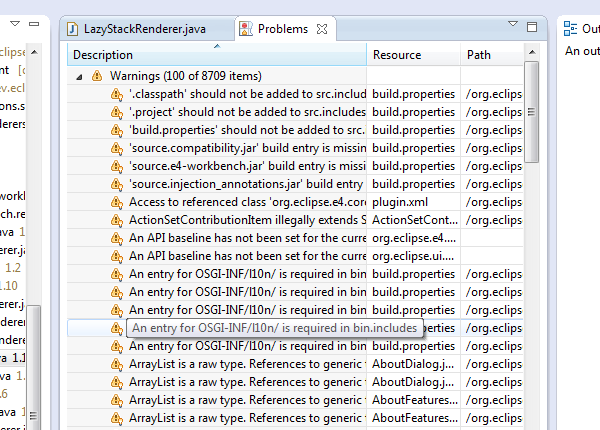 OSGi service lookup. Contexts can be used to obtain references to OSGi services. The context takes care of tracking dynamic service changes and cleaning up unused services when contexts are discarded. Dependency injection. Values from a context can be injected into an application object. This results in injectable fields and methods in the application object being provided with values defined in the context. Injection completely removes direct dependency from application code onto the framework. Storage of functions. Contexts can store functions that are evaluated lazily to obtain context values. A client retrieving values from a context may be obtaining raw values stored in the context, or the result of some function that was evaluated at the time of the context lookup. Traditional change notification, and registration of data-binding style update code with a context. 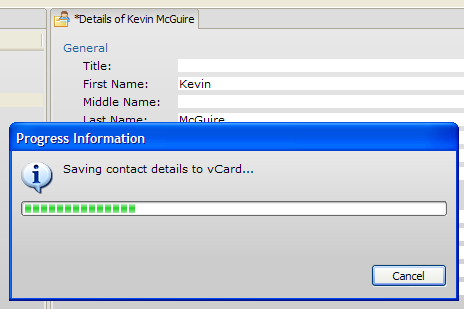 Each time the registered update code is run, the context tracks which context values were referenced. Subsequent changes to any of those values will result in the update code re-running. Updates and events are batched and queued to avoid superfluous notifications. UI service lookup via contexts The workbench provides a hierarchy of service contexts that reflects the widget hierarchy of the workbench itself. Thus when a part obtains a service or data value from its context, it will correctly reflect the widget containment structure of that part. This allows parts to be reused in novel new widget layouts without requiring changes in the part's code. 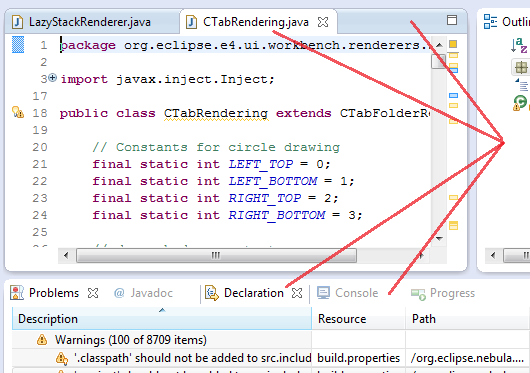 javax.inject annotation support Context injection supports the annotations defined in the upcoming javax.inject package. Now in Java 5 or greater VMs we use annotations such as @Inject and @Named to describe context elements to inject. The internal injection processing has been updated to make use of these annotations, and passes the open source annotation-based injection test suite found at http://code.google.com/p/atinject/. As a result of this work the dependency injection implementation is available as an independent service. While the exact APIs are still under construction and will change, we expect to make the javax.inject-based dependency injection available as one of the core E4 services. 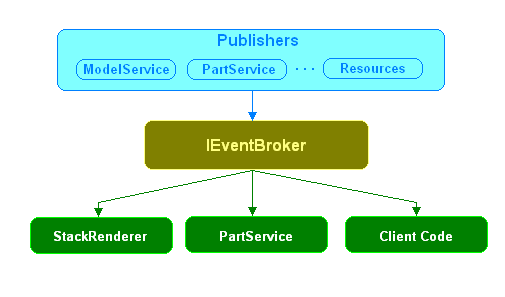 The Eclipse workbench now has an event bus style architecture based on the publish/subscribe pattern. This means a 'one stop shopping' approach for workbench clients; any user interface event we expect a client to be interested in (UI model changes, part life-cycle events, etc) will be available through a common mechanism simply by registering an event handler against the appropriate topic.